Free crochet pattern to make drapery tie backs with tassels. 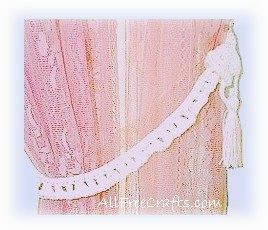 Useful, easy to make free crochet pattern — and perfectly wonderful if you would like to add a delicate Victorian note to your draperies and decor. Row 1 Ch 146, hdc in 2nd ch from hook, hdc in each ch across, turn. Row 2 Ch 3 ship each of the next two sts,(3 dc in next st skip next stich 2 sts) across to last st, dc in last st, turn. Row 3 ch 1, hdc in each st across. Fasten off. Row 2 ch 2, hdc in each st across, turn. Row 4 Ch 2, hdc in each hdc and ch space, across, turn and repeat. Fasten off. Ch 28. sl st in each ch across, fasten off. Cut one strand about 10 inches long, set aside. With your cotton crochet, wrap it around your four fingers about 30 times, with the ending string hanging down. Slip off your finger and slip the chain thru the top loops and fasten, take the 10 inch strand and tie around about a quarter of an inch from the top. Now cut the bottom loops, this is your tassel. Now Place loop through chain with the tassel, and sew ends of rows 1-5 together. Run the loop with tassel thru tie back and tack to the trim of your window.